Join us for an 6 week morning series - Painting the Landscape, Impressionistic style. For the Beginner and Intermediate level adult. 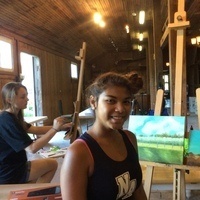 Renee Egen will lead students who will learn Impressionist painting techniques like color mixing and brush applications while painting on Tyler’s park beautiful locations. A supply list will be provided upon sign up. Renee Pelletier Egan is a seasoned Bucks County artist/ teacher, Who has dedicated 20 years to teaching adolescent students drawing and painting techniques and principles. Renee went to several art schools and has studied at New York School of Visual Arts, Paier School of Art, and Pennsylvania Academy of Fine Arts. She received her educational teaching degree from The College of New Jersey and has taught art in several New Jersey public high schools. Renee is involved in several community art groups and shows her work at several juried art shows: the Ellarslie Open, Phillips' Mill Art Show, and Artists of Yardley.